The IEA is constructed above each individual Enterprise Architecture (EA), while SOA is an architecture style and approach that can be applied to EA and IEA where appropriate . 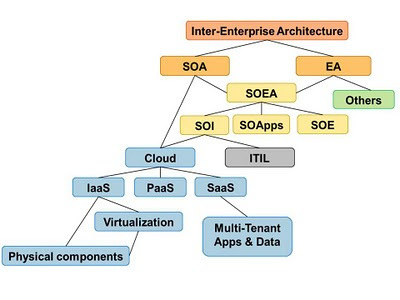 By applying SOA to EA, we have Service Oriented Enterprise Architecture (SOEA) . To implement a SOEA, we can partition it into: Service Oriented Infrastructure (SOI), Service Oriented Applications (SOA), and Service Oriented Enterprise (SOE). The Cloud Computing enables SOI from the technical point of view, while ITIL enables SOI from the management point of view. Under Cloud Computing, we have Infrastructure as a Service (IaaS), Platform as a Service (PaaS), and Software as a Service (SaaS). The IaaS can be implemented by the combinations of virtualized and physical computing environment, though the trend is moving towards virtualization to maximize the benefits. Y. Zhao, Service Oriented Infrastructure Framework, 2008 IEEE Congress on Services - Part I, 2008. Y. Zhao, EA and SOA: A Partnership, Perspectives of IASA Special Issues: Enterprise Architecture – A 20Years Retrospective, International Association of Software Architects, April 2007. Y. Zhao, Enterprise Service Oriented Architecture (ESOA) Adoption Reference, Proceedings of 2006 IEEE International Conference on Services Computing, Sept. 2006.